The debate about the effectiveness of long copy verses short copy seems like it could rage on for another century. And if you market online, you’ll notice the effectiveness of the long scrolling sales letter has taken a nose dive. All you have to do is look at your web metrics and you’ll notice visitors fleeing these pages in droves. Creating shorter landing pages that look more like “space ads” than direct mail letters is one approach. Most important is creating irresistible, low cost front end products or self-liquidating offers that allow you to capture the postal address of your prospects. Once you have this, no spam filter can block your message and your long form sales letter has infinitely more power when it’s in your prospects’ hands verses the fleeting moments it’s on their screens. As you know by now, the answer to the long copy verses short question is it depends on your market, offer, product and list. And testing is the only way to know. Here, in my view, is the best and most succinct explanation about the merits of long copy written 33 years ago by David Ogilvy. 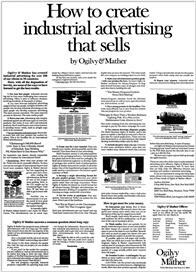 Ogilvy & Mather has prepared many industrial advertisements with very long copy. Yet readership research shows that the vast majority of the readers of any advertisement never get beyond the headline. 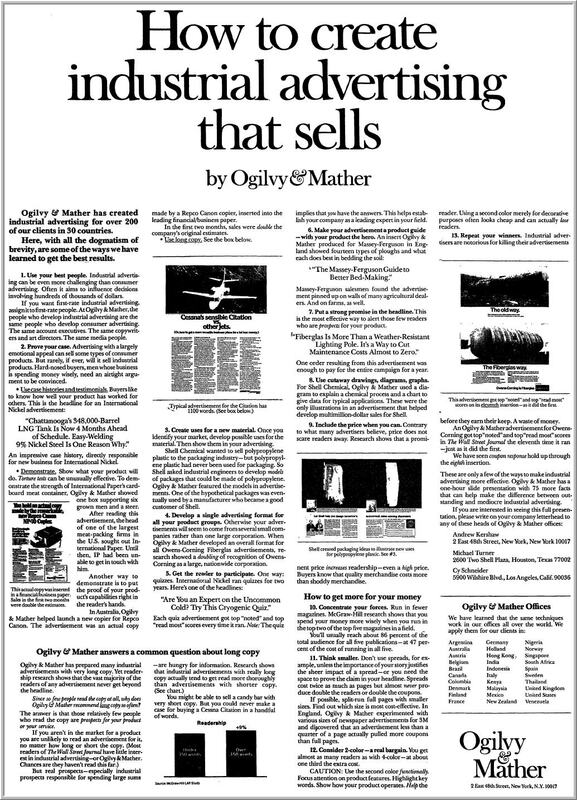 Since so few people read the copy at all why does Ogilvy & Mather recommend long copy so often? The answer is that those relatively few people who read the copy are prospects for your product or your service. But real prospects — especially industrial prospects responsible for spending large sums — are hungry for information. Research shows that industrial advertisements with really long copy actually tend to get read more throughly then advertisements with shorter copy. You might be able to sell a candy bar with very short copy but you could never make a case for buying a Cessna Citation in a handful of words. Here is a large version of: How to Create Industrial Advertising That Sells. I think David Ogilvy is a must read for anyone who wants to go into marketing in any form. So much so that I did a 3 part critique of his predictions for the Ad industry in his book: Ogilvy on Advertising. Apple uses around 35 pages of copy on its website for every one of its products. It just doesn’t look or feel like 35 pages, and that’s the trick.